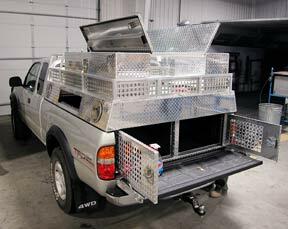 CUSTOM TOOL BOXES FOR TRUCKS -Pickup Trucks, Semi Tool boxes, Cab guards, Pickup Headache Racks, Cargo slides, Truck Flatbeds, RV Truck Tow bodies, RV Hauler, RV Toter, Trailer and Flatbed underbody toolbox manufacturer since 1980. 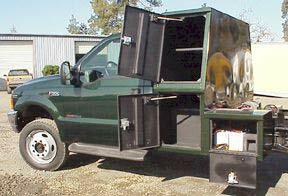 Highway Products, Inc. "Since 1980"
"Highway Products - Largest Manufacturer of Custom Tool Boxes on the Planet." 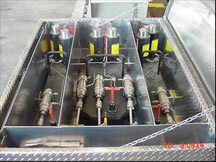 We'll customize any product we make to your specifications. One of a kind projects keep our skills honed and give our customers the opportunity to organize their trucks to maximum efficiency. 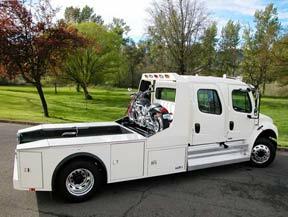 Need a special sized tool box for your semi truck? 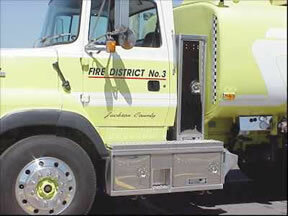 Or a fire fighter rig that suits your terrain? Or just want something unique that your buddy doesn't already have. We can do it. 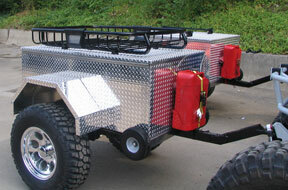 We even have a full line of aluminum boats we build from scratch called Pavati Marine. Take a look below. You'll see we love custom projects. 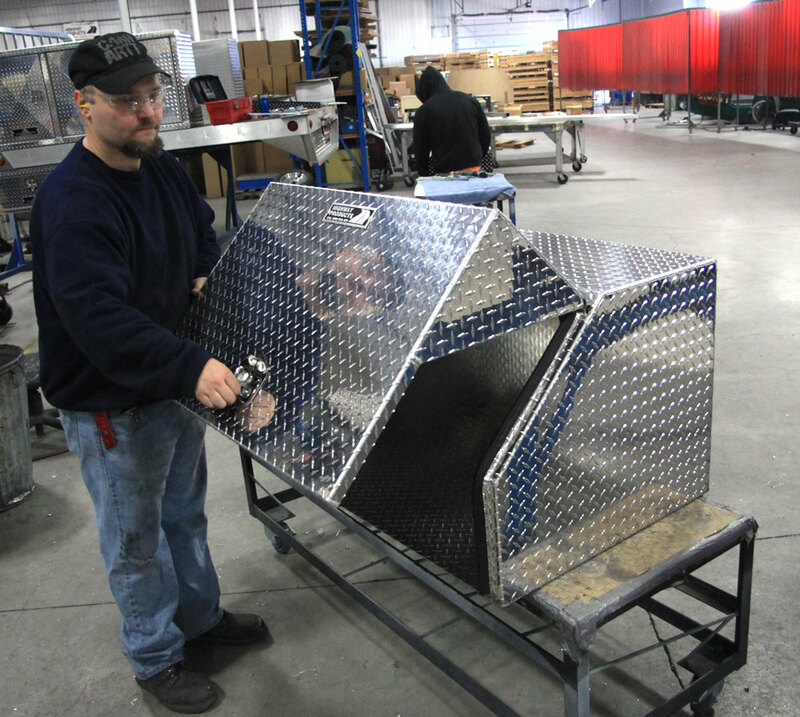 Custom Truck Tool Boxes, Truck Flatbeds, Service Bodies, our Famous Roller Coaster™, Enclosures, any of our products can be built the way you need them. It's as easy as 1-2-3 to order a custom product. 2. The Engineering Department produces prints for your OK.
3. 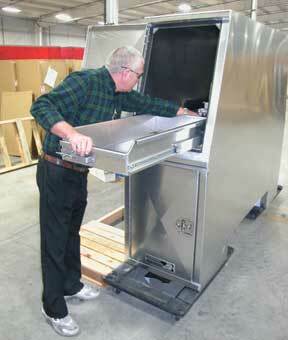 Our Custom Fabrication Shop builds your product. We do this every day. Got questions? Need a quote? We're Fast! 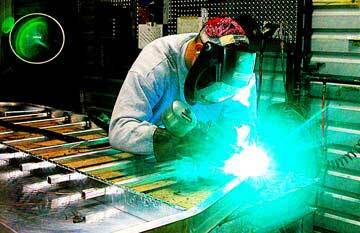 Normally we can give you a quote within the hour and a preliminary blue print the next day. You name it. Either we've done something like it before, or we'd like to take a crack at it. Our top-flight engineers use state-of-the-art design CAD/CAM programs and apply their cumulative 100 years of practical experience to every product. A Few Samples of Custom Projects We've Done. 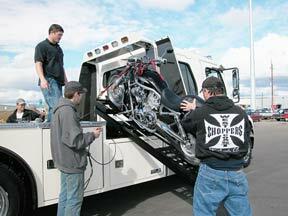 Custom Highwayman® RV hauler with a motorcycle bike ramp. Custom tool boxes for military weapons. 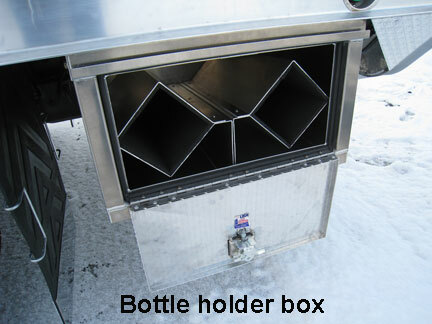 A forest fire fighting truck needed a place to store a couple oxygen bottles on their truck. 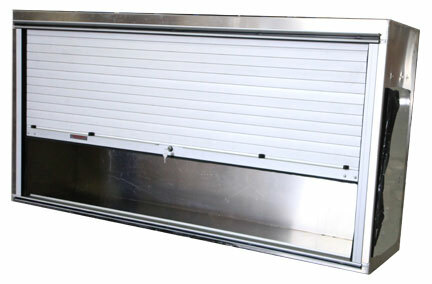 We can install roll-up doors which are very water resistant and lockable. 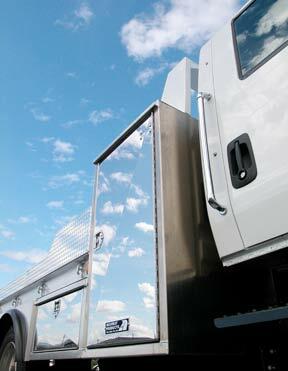 They work great in places where space is limited, plus give you an unobstructed entry. 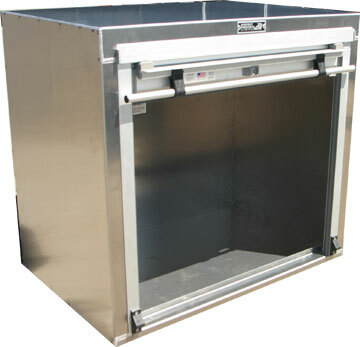 Click here to see our drawer page. You tell us what you want, we build it! We got our start in the semi truck industry and love to build custom boxes for them because they look so good. 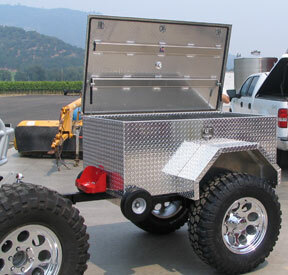 This customer (above) had us build him an aluminum diamond plate tool box with fenders. 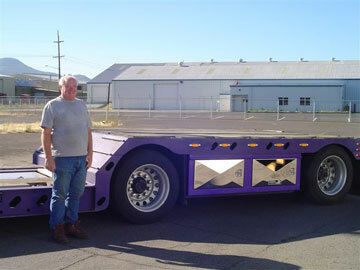 He built this custom rock crawler trailer. See a bigger picture on our trailer page. This customer does light service work on his farm machinery and needed a good air supply to run larger air tools, plus pump up an occasional tractor tire. 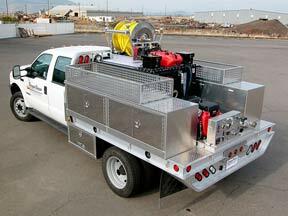 Think you need a gas motorized compressor to do the job? 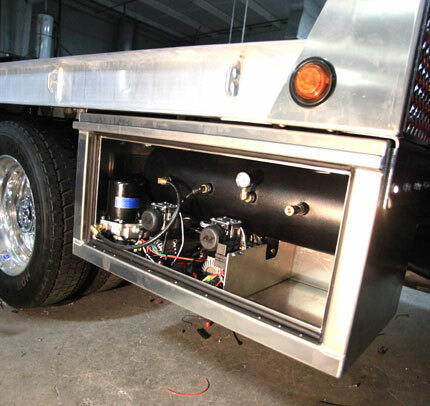 Mount this 12v air compressor unit to your truck, connect the wires to your battery (switched from the dash) and go to work. 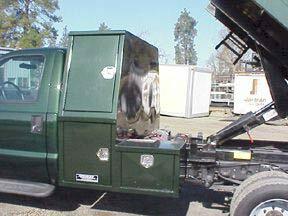 In this unit, we incorporated (2) Viair electric air compressors with an eight gallon tank which also supplies his air ride system on the truck. 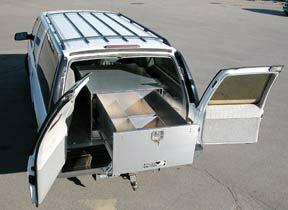 All in a 36Lx18Hx18W tool box that fits under most one-ton flatbeds with bonus room for air hose and a couple air tools - under lock and key. 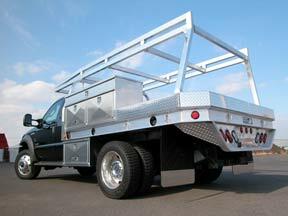 Highway Products can build this unit or one similar to meet your specs. 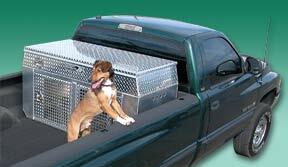 By popular demand, we've brought back our kennel boxes for pickup trucks and SUVs available by special order. We stopped manufacturing kennel products because we needed to make space for some other products we were making. Our customers were so upset about this that we decided to put them back into production on a make to order basis. 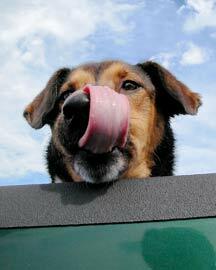 Click on a picture to get to our kennel box page. This customer wanted a special box built for special needs. 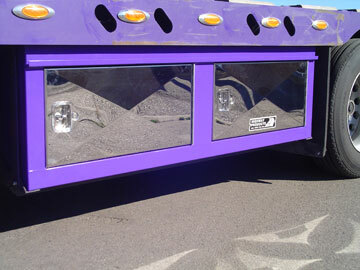 Powder-coated with polished diamond plate on the bottom, polished aluminum trim on the top. Our engineer John Spencer's happy hound, Parker. How do I buy? Click here. 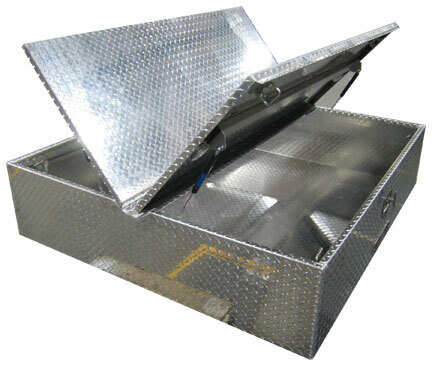 Tell your dealer to install only Highway Products tool boxes for your truck or trailer. Got questions? Need a quote?